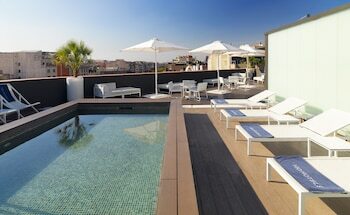 Located in Barcelona (Eixample), H10 Casanova is within a 15-minute walk of Casa Batllo and Placa de Catalunya. Featured amenities include complimentary wired Internet access, a business center, and complimentary newspapers in the lobby. Event facilities at this hotel consist of conference space and meeting rooms. Self parking (subject to charges) is available onsite. Located in Granada (Central District), Hostal Sonia is within a 10-minute walk of San Jeronimo Monastery and Granada Cathedral. With a stay at this villa in Buger, you'll be within a 10-minute drive of Museu de Sa Jugueta Antiga and Paintball Fantasy. Located in Sanxenxo, Hotel Campomar is within a 15-minute walk of Foxos Beach and Lanzada Beach. Free self parking is available onsite.